Monday morning I had an early morning training near the Viera Wetlands, so I made a very quick trip over there. Heavy cloud cover stalled the arrival of the morning light, so I had to take what I could get. The sounds of these early morning calls are unmistakable to anyone who has spent any time around a Limpkin. I came across the top one first who seemed to be mimicking a rooster and trying to wake the place up. Just around the corner, I encountered another Limpkin; this was obviously the recipient of the first Limpkin's calls. She alternated some preening with some calls of her own. 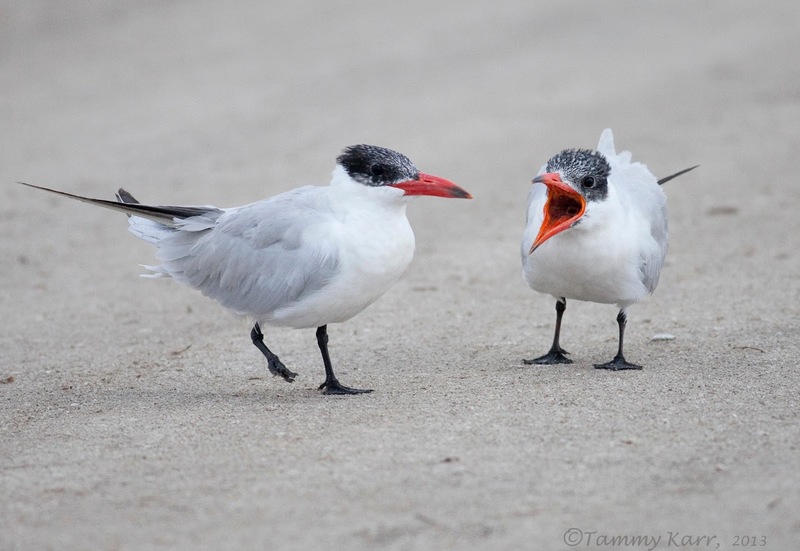 This pair of Caspian Terns was engaging in some early morning squabbling. The tern on the left looked somewhat annoyed by the other terns nagging. Soon after, the terns took flight and seconds later this Crested Caracara swooped in to retrieve a fish the terns must have left behind. The tern quickly came back to try and get the fish back. The Caracara took off and the tern went after it. I was very surprised to see how aggressive the normally docile tern was toward the Caracara as it attempted a midair strike. Soon I'll be heading to the Texas (El Paso)/New Mexico region. Any birding tips for this region would be greatly appreciated! Very good shoits again..... nmice birds Tammy. 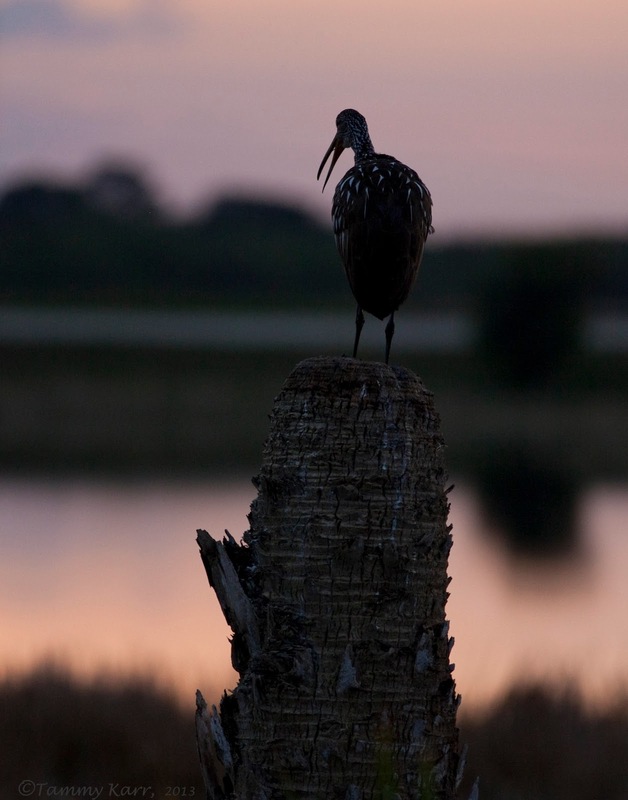 I love the light in your first photo Tammy, perfect for the Limpkin in silhouette. You made me curious about what they sounded like and after listening to them I can only imagine how eerie it must have felt watching them in the overcast morning light, the sounds echoing off the water. Great photos Tammy, so sharp and detail. I love the light in your pictures. Tammy, your early stop turned into a wonderful photo shoot. Love the morning skies, loud Limpkins, squabbling Terns and the fish snacking Caracara. So many great shots for a quick trip! 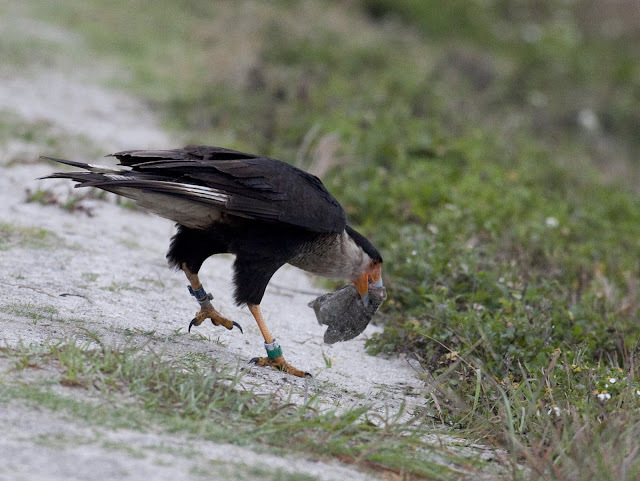 Interesting to see the banded Caracara. I still haven't been able to see these guys in person yet. I'm hoping they send me to Melbourne to work but it just won't happen. 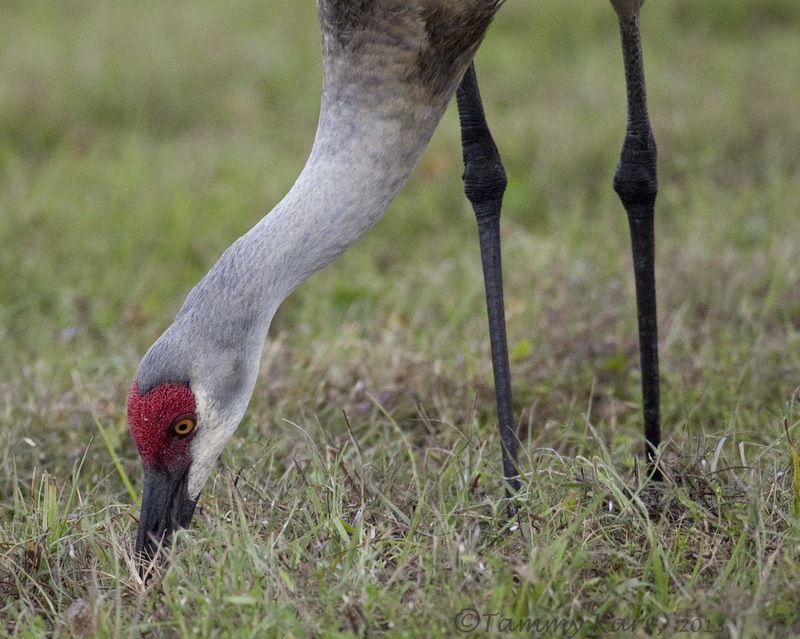 What treasures at Viera Wetlands! 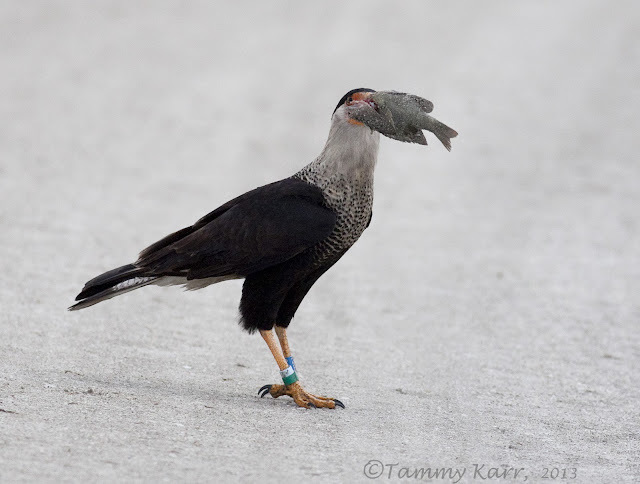 I love tha Limpkin and CaraCara. 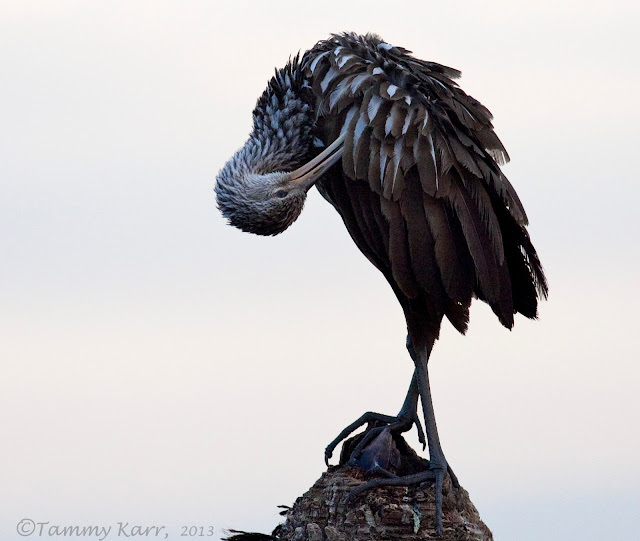 Well done Tammy.. Great pictures of this fantastic birds.., I´d like to se them some day.. Regards from Madrid..
love the limpkin w/ his tongue. and the terns are so darn cute! happy west texas birding! Great photos Tammy! That Limpkin helped wake me up here in AZ too. Wat een prachtie ontmoetingen heb je gehad ,geweldig. Beautiful lighting in the shots Tammy. Very nice. Have a great trip. I hear the Sandia Crest area is good was going to go there then decided on Colorado.Hope you see a road runer. It just goes to show you don't have to have perfect weather to have good birding! Great photographs! I love hearing the Limpkins calling early in the morning. Based on the banding information I could make out on your Caracara's left leg, it appears to be the same bird I photographed in February. According to the USGS biologist who banded him, he's at least 10 years old and has remained in that area all of his life. 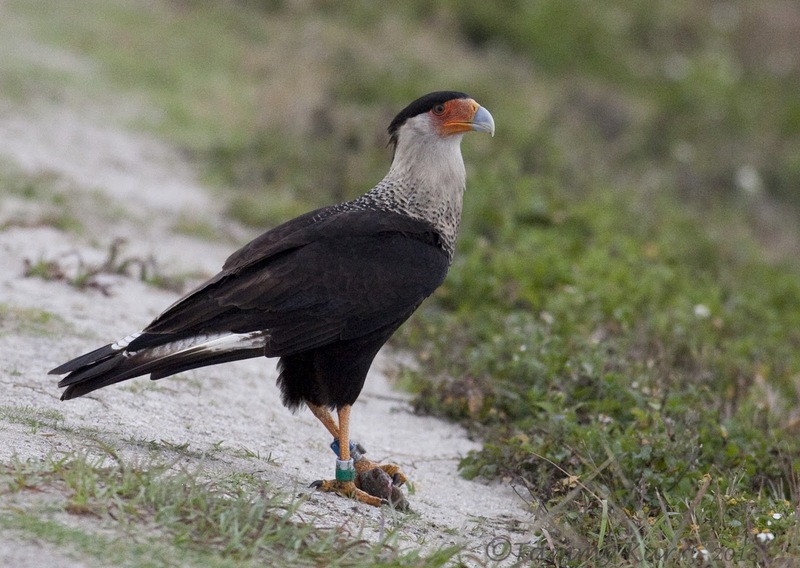 The Caracara is very "site loyal" and they seldom migrate. Tips for your upcoming trip: TAKE LOTS OF PICTURES FOR US!! Beautiful series. We were just at Viera Wetlands, too. Great birds, Love the Limpkin and the Caracara. The terns have always been a favorite of mine. I hope you have a great trip to Texas, is it mainly for birding? 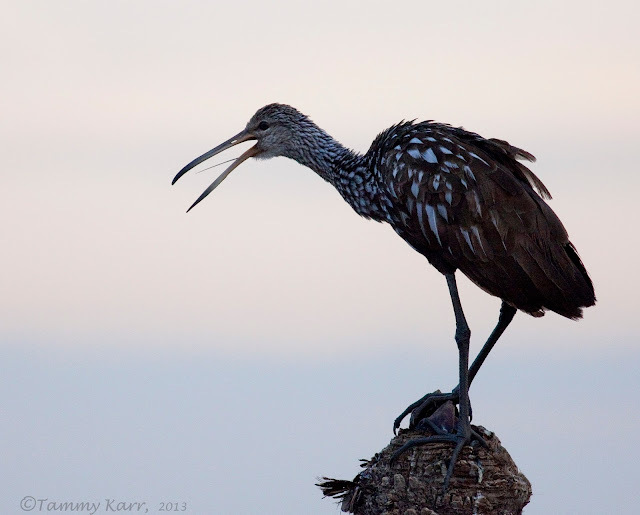 Wonderful birds Tammy, especially love the Limpkin images. I miss them and their call. Looks like you had a terrific morning photo shoot. Wonderful! A great post Tammy, especially considering the difficulty it is to takes photos with a bad light! The Limpkin is a great looking bird and perched on the dead palm tree he makes a wonderful pic! The terns are magnificent so are the Caracara and the crane. Well done and I will be looking forward to your pics from New Mexico! Amiga Tammy, admiro tus fotografías. Tanto las especies que nos muestras (desconocidas en Europa) como la calidad de las tomas. Tammy, these are absolutely beautiful! Great birds you have over there, the Crested Caracara and the Limpkin especially. You had taken them with ease Tammy. Good pics as always ! Eastern greetings from Norway Tammy ! Impresionantes imágenes Tammy eres una fotógrafa maravillosa ademas de intuir que eres una grandísima persona. felicidades por ambas cosas. saludos desde Extremadura. I recognized most of the birds but the Limpkin stumped me:) Such beautiful and different scenery. I can only imagine what your reaction was from tropical ocean to deserty desert:) I think that's the best part of birding.....all the crazy habitat changes!